But did you know that its courtyard contains several monuments brought from Istanbul (Constantinople)? Due to the rising conflict between Orthodox and Catholics and financial situation of the Fourth Crusader, Constantinople was besieged in 1204 by Fourth Crusader. The Siege of Constantinople resulted with mutinous Crusader armies’ capture, loot, and destroy parts of Constantinople, the capital of the Byzantine Empire. Commander of this army was Enrico Dandolo and his grave is in the upper floor of the Hagia Sophia. The siege was followed with a small Latin Empire based in Constantinople and lasted until 1261. The Entry of the Crusaders in Constantinople, by Eugène Delacroix. Aforementioned, the Crusader armies looted and vandalized Constantinople and its monuments for more than 50 years. 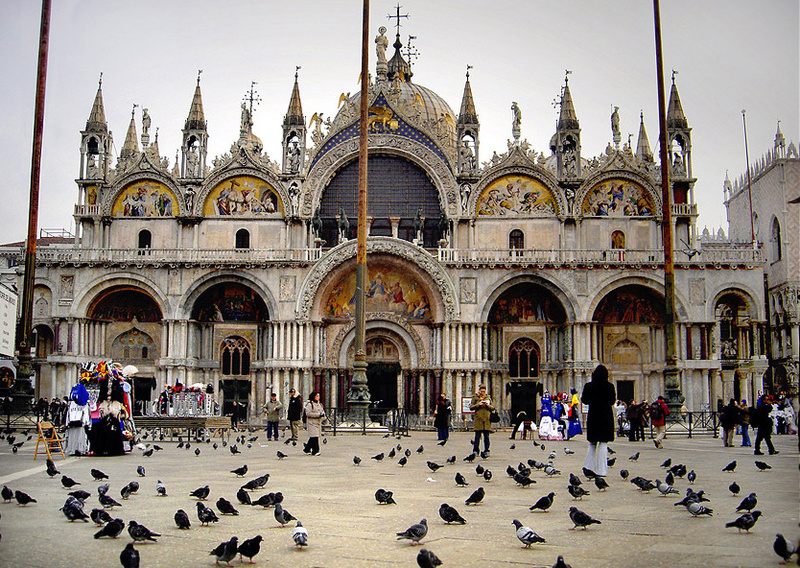 Now several of them decorate the courtyard of St. Mark’s Basilica in Venice. Also known as the Triumphal Quadriga the four bronze horses were decorating the Hippodrome of Constantinople until 1204 according to the primary sources and travelers’ accounts. Hippodrome of Constantinople was next to the Great Palace of Constantinople and some parts of it are still visible in Istanbul, next to the Blue Mosque. 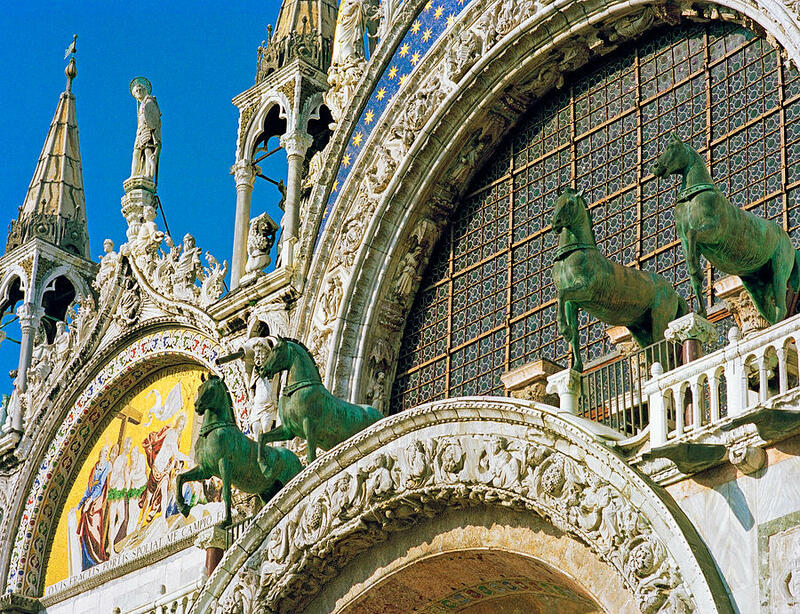 However, after the Siege of Constantinople by Fourth Crusader (1204) the horses were placed on the façade of St. Mark’s Basilica. They remained there until 1797 when Napoleon brought them to Paris. 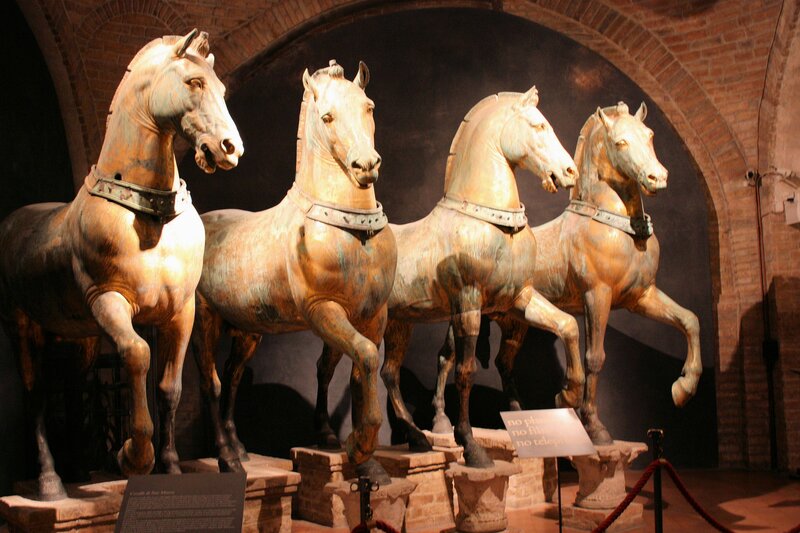 The horses were returned back to St. Mark’s Basilica in 1815. Today, they are exhibited inside the basilica for conservational purposes and their replicas decorate the loggia above the porch. 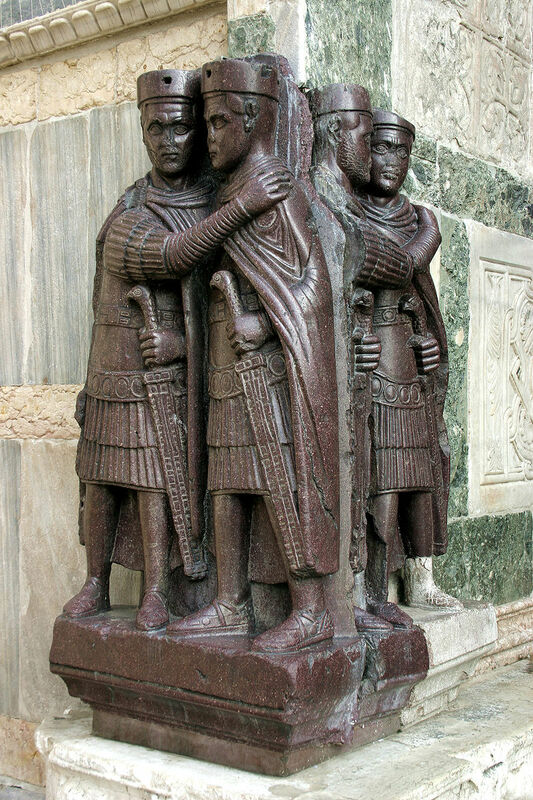 Portrait of the Four Tetrarchs is a porphyry sculpture group of four Roman emperors placed into a corner of the façade of St. Mark’s Basilica. Its history was a mystery until 1960s. During Bodrum Camii (Myrelaion Palace) excavations in 1960s, directed by Cecil Striker and Istanbul Archaeological Museums, a small porphyry piece was discovered. 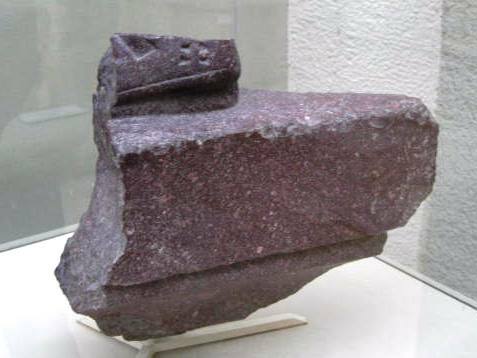 It was found out that small porphyry piece was a piece belonging to Portrait of the Four Tetrarchs. In addition, Russian pilgrims who visited Constantinople in the tenth and eleventh centuries attest that prominent intersection point of Constantinople (Philadelphion) was decorated with two columns carrying porphyry emperors’ statues. 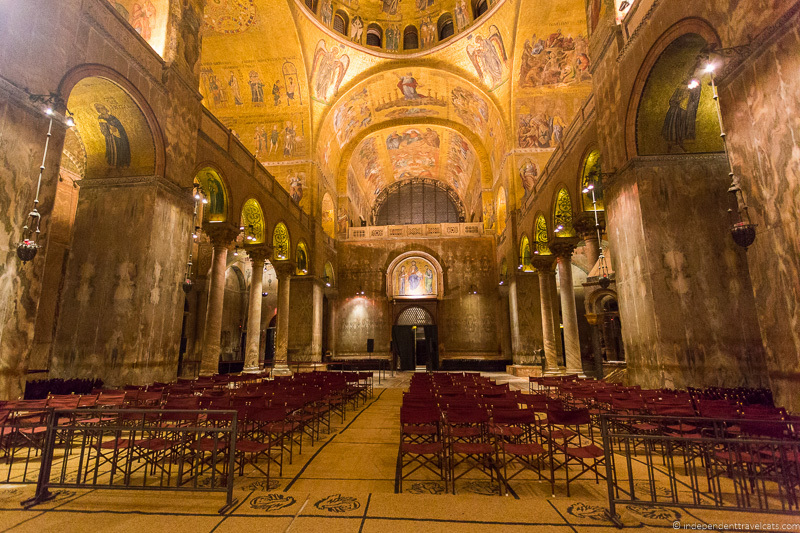 It is very probable that these sculptures were brought to Venice by the Fourth Crusader after 1204, because another Russian pilgrim visited Constantinople right after 1204 describes these sculptures “as large as people and made from red marble. The Franks damaged them; one was split in two and the other had its hand and feet broken.” Today, the sculptures are visible in the courtyard of St. Mark’s Basilica, whereas the missing heel is being exhibited in the second floor of Istanbul Archaeological Museums next to the Topkapı Palace.